Prince Albert II, President of the YCM follows the steps of his great grandfather Prince Albert I, an experienced navigator and pioneer of modern oceanography. Just as his great-great- grandfather spearheaded the first ever powerboat races, Prince Albert II will organize the next generation of revolutionary boat races, strengthening environmental awareness. Solar powered boats from the world over will compete over two days in the first world solar race in open Mediterranean waters, developed by universities in various nations and driven by young students, displaying ability and stamina. The Solar 1 MC Cup 2014 will showcase the latest in solar-nautical engineering from all over the world. The program will include Solar boat races and 25 teams have already registered from Indonesia, Brazil, USA, China and Europe. There will be also Solar conferences, Kids solar boat model race, and the world’s largest solar-powered vessel Planet Solar already confirmed their participation as Jury Boat. This catamaran of 35 m fed by 536 m2 of photovoltaic panels, introduced by the Swiss Raphael Domjan, was last seen in Monaco during the Spring of 2012 at the end of one of its world tours. The winning team will have to prove exceptional strengths and skills in design, engineering and technology. Solar boats are electrical boats, with independent, quiet and clean engines, whose batteries store free energy from the sun. History shows that e-boats are nothing new, but solar drive systems are an interesting development. Silent, non-intrusive, and eco-friendly, solar boats have become the viable option. The clean technologies involved in the environmentally friendly solar boat races have a positive impact on the Principality’s ongoing efforts to protect the seas, placing the country at the forefront of innovation. There is a brand-spanking new yacht unveiled at the last Monaco Yacht Show in Monte-Carlo, the Emax E-Volution solar hybrid yacht that is a triple threat creation that can run on marine diesel, solar power, and just plain old wind. But the schooner by luxury boat maker Sauter Carbon Offset Design has a ticket price of 40 million US dollars, a bargain! Helios was the incarnation of the sun in Greek mythology, and described as a handsome youth bearing the shining aureole of the Sun indicating his solar attributes: powerful, fiery, bright and tireless. 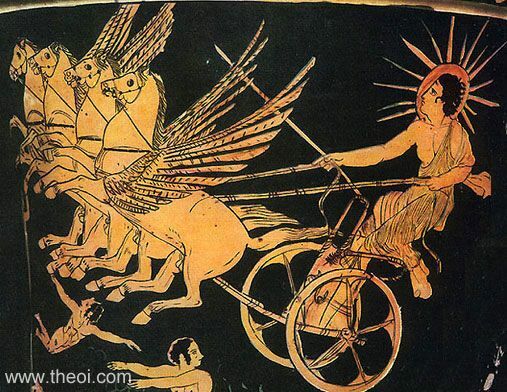 He drove his chariot of the sun, pulled by the four horses Pyrois, Eos, Aethon and Phlegon, across the sky each day to earth-circling Oceanus and through the world-ocean returned to the East at night. As time passed, Helios was increasingly associated with the god of light, Apollo. However, in spite of their fusion, they were also often viewed as two distinct gods. Helios was a Titan a member of the earlier order of gods that preceded the Olympians as Apollo was. The equivalent of Helios in Roman mythology was Sol, specifically Sol Invictus. Every hour the sun beams onto Earth more than enough energy to satisfy global needs for an entire year. Solar energy harnesses the sun’s power and make it useable, but today the technology produces less than 0.001% (one tenth of one percent) of the global energy demand. Although the sun is over 90 million miles from the Earth, it takes less than 10 minutes for light to speed across that distance. Only 0.01% of the energy produced by nuclear fusion in the sun per second would be needed to satisfy the entire population of the earth’s energy requirements. Solar energy has been used by humans for a long time in heating, cooking food, removing salt from seawater and drying clothes. In 700 BC, glass lenses were used to make fire by magnifying the sun’s rays. Other passive technologies are for example big windows placed on the sunny side of a building allowing sunlight to heat-absorbent materials on the floor and walls, with those surfaces releasing the heat at night to keep the building warm. Similarly, absorbent plates on a roof can heat liquid in tubes that supply a house or building with hot water. The sun is a direct source of energy. Using renewable energy technologies, we can convert that solar energy into electricity, and as technology improves solar power costs have decreased and it has become a more viable alternative competing with other energy sources such as coal and oil. Large number of Solar cells or so-called photovoltaic cells, are put together to create solar panels that convert light energy into electricity. The cells are made of semiconductor materials like those found in computer chips, and when sunlight hits them, it knocks electrons loose from their atoms, and as the electrons flow through the cell they generate electricity. On a larger scale, solar thermal power plants employ various techniques to concentrate the sun’s energy as a heat source. The heat is then use to boil water to drive a steam turbine that generates electricity in the same way as coal and nuclear power plants do. The largest solar power plant in the world is in the Mojave Desert in California, covering 1000 acres. Spacecraft and space stations such as the International Space Station (ISS) often use solar panels to generate power. Space missions have been using solar energy to power spaceships since 1958. All solar lights are wireless, they are not hooked up to external sources of power. Solar lights produce no pollution and cause no harmful environmental effects. Solar lights are immune to black outs. Solar-powered outdoor lighting is virtually maintenance free, since the batteries require no water or other regular service. Solar lights work even after cloudy days. During daylight, even when overcast, the solar panels’ solar generators charge long-life batteries, which store the energy until needed.